Bassist, and multi-talented musician Les July first came to light back in the 1980s, following in the footsteps of his Queens, New York mentors, Marcus Miller and Lenny White. July has been described as "an extremely unique self-contained recording artist-producer who sings, writes and plays several instruments." His new project, "Dreamland" is a 'double album on one CD'. It's a unique combination of great, catchy songs, intelligent, thought provoking lyrics, world class musicianship and great production. All coming from one person who has been known to "exhibit paranormal tendencies." An endorsement from music visionary icon, Kate Bush has brought July worldwide attention via YouTube. His recordings that feature his trumpet playing has drawn many comparisons to Miles Davis. As a producer, his knowledge of multiple genres of music and his ability to 'mash them up', has led to work with artists of many different cultures. While in Los Angeles, July gave of his time by volunteering at Cedar-Sinai Medical Center as a Music For Healing therapist and he has worked with top artists in every vein of contemporary music from Slash to k.d. Lang to Dr. Dre to Herbie Hancock. He produced a short form documentary " On The Fly with Les July ", that chronicles his eclectic life and career in Hollywood, Ca. and features everyone from Stevie Wonder to Adam Sandler. This documentary not only showcased July's wide ranging musical talents, but his on-camera personality as well. July recently moved back to NYC, where his first gig was opening for Todd Rundgren to a sold out crowd at B.B. King's. With recognition in all genres of contemporary music, July has managed to escape categorization as an artist, producer and musician. On Dreamland, July is undoubtedly inspired by Rundgren's legendary solo recordings, not only sings, but plays and mixes all of the instruments on the album; bass, guitar, drums, keyboards and the aforementioned trumpet. July's guitar solo work on the grooving "Clocked", "All This Time" and "Shipwrecked" reveals yet another hidden talent, as does the Spanish-flavored acoustic guitar on "Want To" and the Miles-inspired trumpet on "Whenever"- a gift for good, old-fashioned, songwriting; a lost art in an age of laptops, samples and software. 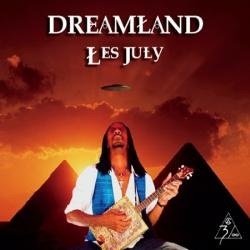 Fellow writer and musician Paul Myers, author of 'A Wizard A True Star : Todd Rundgren In The Studio, aptly wrote that "Les July's Dreamland is a catchy and well-played set of crafty songs that make you think, dance and feel. And in this increasingly desensitized world, the ability to still feel anything at all cannot be taken for granted…"
I have to concur; a great effort by July and I look forward to more work from this "disgustingly talented" musician.